According to Wikipedia the meaning of Petit four (plural: petits fours, also known as mignardises) is a small confectionery or savoury appetizer. The name is French, petit four (French pronunciation: ​[pø.ti.fur]), meaning “small oven”. This Inipit Petit Fours Recipe is a great alternative for expensive French Macaroons or Cupcakes. Inipit Petit Fours small glazed cakes is an elegant and delicious gift also a great dessert centerpiece that can capture the eyes of your guests especially kids. First, we need to prepare and measure all needed ingredients. In a large mixing bowl, place 10 pieces Inipit and crushed the sponge cake with a fork until it turns into a soft crumb. Add in crushed cashews or crushed graham and sweetened condensed milk. Mix with a fork until evenly moistened and a little bit sticky. Using your desired molder divide the dough evenly and press into the mold. Repeat process until you are done with your cake mixture. Chill the cake for about 20 minutes to firm and set. Meanwhile, in a small saucepan, over a low heat, melt the butter. Add in the cocoa powder and stir until melted and smooth. Alternately add the powdered sugar and milk in two batches, stirring constantly to melt and smoothens the ganache. Fire off, add in vanilla extract and stir until well combined. Let it cool slightly, but still with a pouring consistency. Place chilled mini-cakes into a wire rack with a tray below to catch the ganache drippings. Pour ganache over each cake to cover completely. Leave the cakes on a wire rack until the ganache sets and cools down. Decorate with sprinkles or crushed nuts on top, or add fondant toppers is you prefer. Transfer to a serving plate and let it chill before serving. 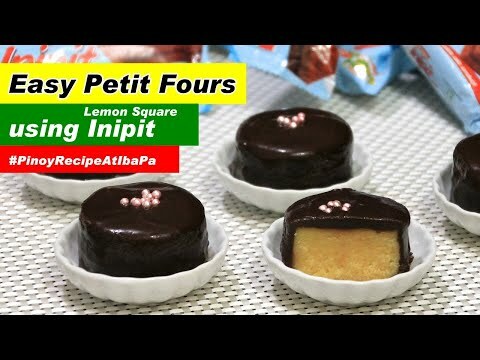 Inipit Petit Fours Recipe are a sweet treat or a stunning dessert for any occasion. Oh my gosh these are so adorable and fancy! I love lemon so these will definitely be on the menu soon! This looks cute! Normally I don’t like anything with lemon in it, but this looks good.